Listed as one of the top 10 design trends for 2017, spiral staircase installations have definitely made their way back into our homes, lofts, offices, and hearts. 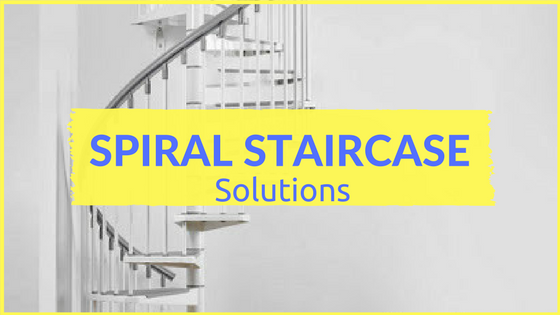 This timeless spiral stairs design originated way back to the 5th century BC, and then widely adopted by the Roman Empire 2nd century 113 AD after the famous and influential Trajan’s Column was completed. This groundbreaking utilitarian innovation would soon become a staple in most types of architecture where small, confined spaces (Like towers) were prevalent, or where the overall goal was to ‘Build up’. Fast forward two millennia and the spiral staircase is still widely used today with one major difference. The form is now as important as the function. Here is just a quick overview of how your stair will assemble in five easy steps. You’ll generally start with a center column that is 4” or so in diameter. You should start the process by mounting the column in an upright position to a tube or other type of footing that will support it. Then, slide your treads which are the steps, one by one down the center column, so that they will stack up. Then, slide your top platform over the center column the same way you did with the steps after your steps are in place. After your steps and platform are in place, it’s time to set screw everything in place and then connect your steps with the balusters which are the spindles. Although this is probably going to be the most time-consuming step in the process, it’s still very simple to do. After the addition of the spindles, move on to adding your hand-railing. Your handrail should already be custom formed to the height and diameter of your stair. Your handrail should lay on top of your spindles for an easy connect. Please give us a call or e-mail to schedule a free estimate. We’ll be happy to bring project books, catalogs, and advice to your home so you can explore the color, texture, and style. If you would like to contact us by phone, we can be reached at our office at 770-813-9070.